Yesterday, I was unhappily reminded of the distressing fact that last September, due to my weight loss, I gave away most of my fall/winter wardrobe. Well, yesterday, I poked around looking for any trash bags with my name on them and found a whole lot of naught! So I asked Steve to look up in the attic, thinking maybe I'd stored them up there. He also found a wide variety of naught. But alas. No Trash Bags Containing Becky Clothes have shown themselves. The house is filled with naught in the trash bag department. And so today, I shall take myself over to Goodwill and began to rebuild my winter wardrobe. I think I recall having this same Trash Bag Clothing Crisis in the spring, too, but that wasn't quite as crisis-esque because at that time, I wasn't a pastor's wife and so I didn't really need any sort of wardrobe, beyond some capri pants and a few blouses to wear to our (casual) home church. Oh well. At least Wardrobe Rebuilding gives me a legitimate reason to shop! And now that we are finished collectively mourning my missing trash bags, let me answer a few more questions that have come in. Q. Will Sarah keep on going to Duke for her medical care? A. Duke is about four hours away from Manteo as opposed to being one hour away from Smithfield. Because of that, we'll only drive over there if there's something that is cancer treatment-related. She was actually due to go there in December for her once-a-year, post transplant studies, but I contacted them and asked if she could have those done in late October instead, so that we didn't have to drive so far. So we've been scheduled to go to Duke the last Thursday in October, right before we make our move to Manteo. Although I'll be finding a pediatrician for her in the Manteo area for her "regular" check ups, she also sees an endocrinologist, a pulmonologist, a dermatologist, a cardiologist, as well as neuropsych people. I'm not yet sure what I'll do about all of those folks. A. I don't! So Lynie, when you fill me in on the answer, I'll share it with everyone! Q. Is is hard to find a rental that will accept dogs? A. Thankfully, the lady from the church who is letting us use her small vacation cottage on the weekends in October is allowing us to bring Snowy. However, as we've been looking around for a long term rental, we have run across a good many that don't allow pets. But since Snowy is a valued member of our family, we'll just have to look a little harder! Q. What was Snowy's reaction to your fall? A. I really don't think he was aware that I was in much distress since I didn't make any loud, "distressed" noises. Probably from his perspective, it was like one minute I was standing beside him, the next minute, I was lying beside him. No biggie. His doggie brain doesn't understand that when women suddenly topple over like large leaning Towers of Pisa, it is NOT such a good thing. A. The two older girls and the husband seem to be coping better than the youngest daughter; she is having a really hard time of it since was the closest to her mother. The church family has just really taken them in and loved on the entire family so I think that has really helped. When you think about it just keep them in your prayers. And now, one final Manteo story and I will close. Last Saturday, we were looking at a possible home to rent, owned by a lady in the church who lived in that house while she was growing up. She told us that she remembers one particular day many years ago when a knock came on the door of that house. When she answered it, she saw a young boy who lived nearby who had lost his dog. He asked if they would please keep their eyes open for the dog because he really wanted to find it. That little boy was twelve-year old Andy Griffith, who still lives very close to that house we're considering renting. Nice to have such interesting history all around. And just so you can picture a little easier where all of this Smith/Manteo Life is taking place, here's a map of the area. 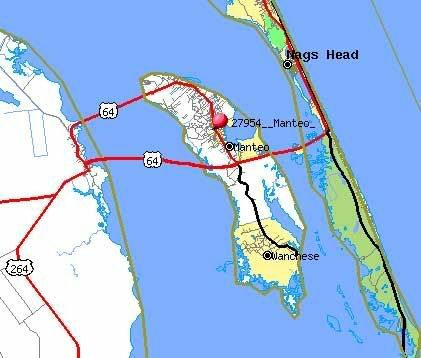 Roanoke Island is in the middle with two bridges onto the island and one bridge off. The strip of islands to the east of Roanoke Island is called The Outer Banks. If you drive north past Nags Head about 10 miles, you will come to Kitty Hawk, where the Wrigtht Brothers first flew. 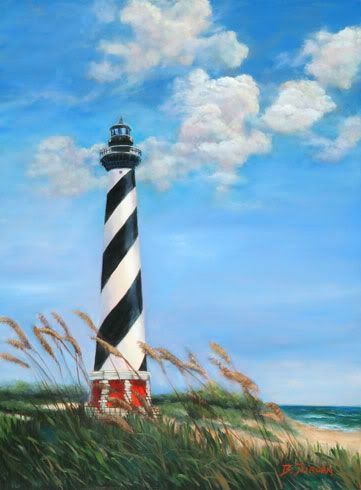 If you drive south for about an hour, you'll get to Hatteras, where one of the most well recognized lighthouses in the country is. So that's your geography/history lesson for the day! Okay. I'm off to Goodwill. Wish me happy hunting! Pineapples in the south are associated with Southern Hospitality, or so that's what I have been told my entire life. I was born in SC and raised in Charleston, Sc until I moved to Ohio at age 42. I am a southern lady in Ohio!! I love and miss the south. Pineapples are a sign of hospitality. It is mostly used in Hawai'i (big surprise) and in the south. Just a quick note [from a first-time commenter] to affirm what Debbie and Lisa said. At least in the southern part of the US, the pineapple as a sign of hospitality originated in the colonial era. They were a rare commodity, and among the most precious treats one could offer guests. Displaying a pineapple on a sign or over a doorway was a sign that one was willing to offer that special conviviality and welcome to whomever entered. Becky- Perhaps you should email Nate and Tricia (from CF Husband). They live in Nags Head and he is a Pastor or Reverend of Brother or something (sorry this little ole Jewish girls gets confused). I just know he is NOT a Priest (LOL). With Tricia having CF and Gweneth being a preemie with many specialists they may be able to help. In fact, I think they still make the trip to Duke. They may be good people to contact about the area. Just a thought. PS. Mom Campbell I hope you are starting to feel better. We are all praying for a speedy recover. We stayed in Buxton within walking distance of the famous lighthouse for 2 weeks in September...Next year our 2 weeks will be back in Avon (in August)..this was the first time we had stayed in Buxton and loved it but the house situation won't work next year; we are bringing our kids (2 families)..so back to a BIG house in Avon. We will also be in Kitty Hawk the week following Christmas. Maybe (if we are there over a Sunday) we will pop in to the Assembly of God in Manteo...(My hubby is pastor of a non-denominational Christian Church). In my family, when someone buys a new house or basically moves into a new home, they always put out a pineapple. It's seen as a "welcome to all" kind of thing. My sister even put up a doorknocker of a pineapple! Hope you found some great bargains today. The map and pictures you showed reminded me of the trip Chlorita and I made to the Outerbanks just about a year ago. We did see that light house and stayed in Kitty Hawk. We also had the great pleasure of dining with you, Steve, and Sarah. Meeting for the first time. Still trying to plan a trip back there for my 55th BD in Marchand hope to see all of you again. This time I will cook! Hope you are feeling better after the fall, sounds like something that would happen to me. Oh something close to that did. My neighbors dog got lose last week, much larger than Snowy. I got ahold of his collar to take him home. He took off and I hit the ground. Knee is skinned up, but it could have been so much worse. I did get Lola home though, even with a bloody knee. Fingers crossed you found many shopping gems. I love lighthouses! Thank you for the photo! Oh, and tell Andy Griffith hi for me. Regarding the pineapple...the legend I heard was yes, they were very precious and so every one noticed a pineapple in ones home. Well-heeled party-goers back in the day would arrive at a party and a pineapple would be in display upon the mantle, where every one could see it. As the evening progressed and the partiers partied and the guests guested, the pineapple would be in place. However, when the host/hostess was ready to call it a night, they would remove the pineapple from the mantle and place it just outside the front door. Then as people glanced up at the mantle they knew without the host having to announce it or usher folks out, that the party was over. So a pineapple came to signify you are welcome here, make yourself at home and good-bye, thanks for coming! At least that's what the tour guide in Savannah said! How else would an Oregon girl know?